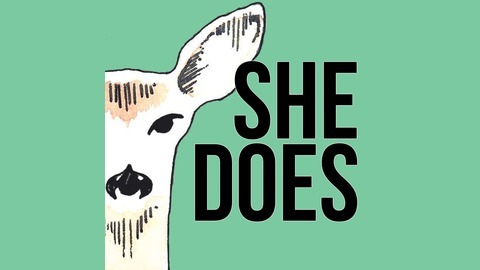 She Does podcast features creative minds working in media. Each episode centers around an intimate conversation yet digs deeper into each woman's background, philosophy and process through artful audio documentaries soundtracked by music made by women. The show is hosted and created by Elaine Sheldon and Sarah Ginsburg, documentary makers who are interested in how their guests got to where they are today. Elaine McMillion Sheldon and Sarah Ginsburg (that’s us) are the co-creators, producers and hosts of this very show, She Does podcast, and maybe you got hints of this from listening over the past year, but first and foremost, we’re documentary filmmakers. In this episode, the tables are somewhat turned and we are asked a few questions by our dear friend, production assistant and member of the documentary community herself, Alijah Case. We talk about what we’ve been up to outside of the podcast and what we are planning on getting into now that we’ve officially decided to taper back on releasing episodes of this show. We aren’t calling it quits completely, especially because we LOVE She Does and have over 10 interviews in the can with some incredible women, but we have decided to edit and release episodes on our own time. We elaborate on all of the news and future plans in this special ‘it’s-not-goodbye-it’s-see-you-later’ episode, reflect on the 31 plus episodes we put out over the last year and the women featured in them, wonderful, impressive, yet very human, each in their own unique way. While the process proved to be quite labor and time intensive, it’s been one of those experiences so magical and so fruitful that it’s hard to put into words, but we do our best with the guidance of Alijah, insights from our illustrator Christine Cover, and music and words by Nona Marie Invie, who recently released an EP titled Sisters with her latest project RONiiA. 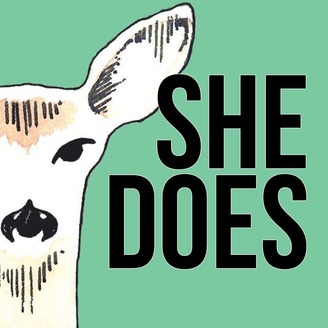 And as always, thank YOU for listening to She Does. KEEP AN EAR OUT in this episode for a little interview with our talented illustrator, the hand behind our little doe logo and all the guest portraits that came out with each episode. Thank the heavens for our Sound Designer and champion of the slow movement, Billy Wirasnik. This show wouldn't have reached your ears without our SOUND DESIGNER Billy Wirasnik. Billy turned our episodes around quick, but he's also got a project that is quite slow. Check out what he's been up to with Slo Media and the slow movement here. This episode's MUSICMAKER is one of our favorites, Nona Marie Invie of RONiiA. Sisters is their recently released EP and the music that soundtracks this episode.